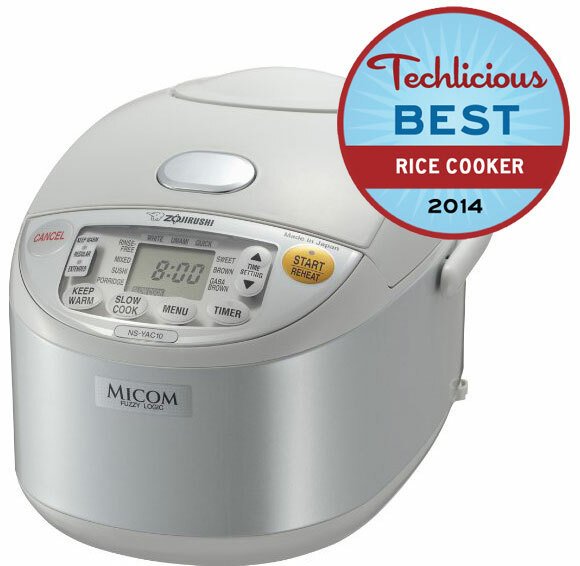 Review summary: We tested pounds of white, brown and speciality rice to determine who makes the best rice cooker. And the winner is the Zojirushi Umami Micom Rice Cooker & Warmer NS-YAC10 ($213) for its outstanding flavor, range of features and solidly-built design. Like the search for the world's best cheesecake or the hunt for the ultimate egg cream, the quest for the perfect bowl of rice can take a lifetime—unless you have the world's best electric rice cooker. It's true that one can ably produce an acceptable few cups of rice on a stove top. But only with an electric cooker controlled by microprocessors and software designed to gauge heat and humidity can one consistently produce rice with the level of taste and consistency approaching the ideal. In our testing, the Zojirushi Umami Micom Rice Cooker & Warmer NS-YAC10 proved to be the best at cooking delicious rice, cup after cup, from plain white grains to brown rice. Speed is not a reason to purchase a rice cooker. One can make rice faster in a pot than any of the machines we tested—even when they are set to "quick" mode. An hour or more cooking time is not unusual, with brown rice taking even longer (the Zojirushi even has a special cooking option that takes about 3½ hours). The point of a rice cooker is consistently making better tasting, fluffy rice that you would be proud to serve your most important guests. There's also the convenience factor: once you've set the machine, you can go about chopping, cleaning and cooking the rest of the meal. There's no need to worry that it's going to boil over or burn or even go cold. All the models we tested have automatic "keep warm" functions that kick in after the cooking is done and will last for several hours. The final reason to use an electric rice cooker boils down to two words: brown rice. No matter how adept you are (or think you are) at making white rice on the stove top, brown rice is a different matter. It usually ends up under or overcooked in a pot. Fuzzy logic cookers, whose microprocessors really come into their own with difficult brown rice, get it right every time. No crunchy kernels or mushy brown clumps. Most models work on the same basic principle. A non-stick pot inside holds the rice and water, sitting on a hot plate that boils the water. Temperature and humidity sensors deliver information to the built-in microprocessor so that the machine knows when the rice is done. All the owner has to do is make the correct selection for the type of rice. We only looked at models that use microprocessors and fuzzy logic software. The latter feature means that the machine can adjust cooking time and temperature depending on, say, the relative humidity or speed with which the rice is cooking (if it is heating up too quickly, it will slow it down automatically). It also enables the machines to handle a wide variety of rices and keep cooked rice warm without drying out the grains or burning the pot. 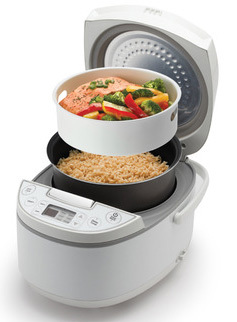 Fuzzy logic cookers may offer simple functions, such as cooking white or brown rice and keeping warm after cooking. More advanced models have the smarts to handle a wider array of rices, as well as settings for porridge and sushi rice. The newest rice cookers use induction cooking. The induction element in the cooker generates an electromagnetic field that draws electrons when a magnetic element (in this case, a pan) comes into contact with it. Heat is generated by the resulting electron movement in the pan. The advantage of induction cookers is that the temperature can be almost instantly adjusted. It is also a more efficient method of cooking compared to traditional electric or gas elements, which waste a lot of heat that escapes around the pot.. Unfortunately, induction models still command a price premium. Most models cost 50 percent more than standard electric cookers and the taste advantage is minimal. Consequently, we only considered standard electric models in our survey. Using a rice cooker requires an extra step some Western cooks may not be familiar with: rinsing the rice before cooking. Rinsing removes any starchy build up on the outside of the grains and any foreign matter. You simply put the measured rice into a bowl and fill it halfway with clean water. Sluice or "fold" the rice gently by hand and the water will become cloudy. Drain off the water and repeat the process until the water is clear. Three or four rinses usually is sufficient. If you skip this step, you'll regret it. The rice cooker will turn into a rabid dog and begin frothing at the top as the excess starch boils over. It's a mess you don't want to have to clean up. The other note about rice cookers is that they use a special supplied "cup" which is actually about 3/4 the size of an American measured cup. The unusual size is said to be derived from a traditional Japanese tool for measuring rice called the masu. So don't throw out the plastic "cup" that comes with your rice cooker. The final important note for rice cooker novitiates is that the non-stick bowls can require extra care. Zojirushi, for example, makes a point of instructing owners to rinse the rice in a separate bowl to avoid scratching the cooker's non-stick pot. On the other hand, Aroma instructs owners to do the opposite and rinse the rice in the cooking bowl. To determine the top three models for our tests, we surveyed the market for machines that had enough capacity to serve an average family of five, which meant cookers that could produce up to 10 cups of cooked rice. We further limited the range of cookers by selecting only fuzzy logic models that could handle different types of rice without requiring special attention. Finally, we surveyed top cooking sites for recommended models, as well as consumer reviews at sites including Amazon. The final three candidates were the Zojirushi Umami Micom Rice Cooker & Warmer NS-YAC10 (consistently well reviewed), Panasonic SR-DF101 Electronic Rice Cooker (cited for its reliability), and Aroma Rice Cooker, Food Steamer and Slow Cooker ARC-526 (a new, inexpensive model from a best-selling brand). We tested the models side by side over the course of several weeks using a variety of rices. We used premium Nishiki white and brown rice. We also tried generic supermarket rice in both varieties. Jasmine rice was also taste tested, although we focused on unadulterated white and brown grains to assess the tenderness, moisture, and taste of the rice itself. Five different taste testers, with palates ranging in age from 11 to 82, participated over the course of the review. All taste tests were "blind" so that reviewers were not told which cooker was used. The rice was tested on its own and as a component of larger meals to judge how it worked with a variety of dishes. We also considered how clear and precise the cookers' manuals and controls were and how difficult or easy it was to clean them after use. The Zojirushi was the most expensive model we tested, but it also produced the tastiest rice—in a variety of flavors and settings. It excelled in several areas, with multiple features to satisfy gourmets and gourmands alike. Zojirushi offers by far the most features for cooking rice in nearly every imaginable form. The 5.5 cup (dry) capacity cooker has a digital display to help you shuttle between its settings. There are two "keep warm" settings (regular and extended) and menu selections for standard, white, brown, quick, and sushi rice settings, as well as sweet, Umami, and GABA Brown settings and one for mixed rice (with vegetables or other ingredients on top). In taste tests it narrowly bested the Panasonic in yielding fluffy white rice. Where it showed its real prowess was in how it handled keeping rice warm and in cooking brown rice. Even after 3 hours in the keep warm mode, rice emerged soft, fluffy and moist. In the other models, rice left for that long suffered by drying out slightly. And in brown rice taste tests, the Zojirushi produced the best textured soft and fluffy brown rice. If you want to push your culinary skills, the Zojirushi also gives you room to grow that other models do not provide. Its GABA setting for brown rice is intended to slowly cook the rice by "activating" it at a temperature of 104 degrees for 2 hours before cooking. It's supposed to increase the amount of an amino acid—gamma aminobutryic acid or GABA—released in the brown rice, producing a softer grain. However, it entails a total cooking time of roughly 3 and a half hours. So is it worth the wait? We found that for rice connoisseurs the GABA setting worked wonders. It brings out the nutty flavor of brown rice without turning it into mush. It produced perfectly cooked individual grains that were firm, but not crunchy. Even our youngest reviewer noticed the difference. More controversial is the hallmark of this cooker, Zojirushi's Umami setting. Intended for white rice, the name is often translated as "yummy." It refers to the theory that there are not just four basic tastes—sweet, sour, salt, and bitter—but also a fifth, umami. It is best described as the satisfying rich flavor that comes from tomatoes, cheese and some cooked meats. It's also present in Japanese dishes using a kelp stock called kombu. Umami is detected when an amino acid, L-glutamate, excites receptors on the tongue. It's controversial because some researchers still deny the presence of this fifth taste. We tried the umami setting on conventional long grain white rice. We enjoyed the flavor, but several taste testers found the rice just slightly drier than that cooked under the conventional white rice setting. However, we also observed that people ate more of the umami rice than they did of the standard white rice. You can draw your own conclusions. The Zojirushi received numerous reviews and write-ups on Amazon, garnering a very strong 4.6 out of 5 stars. Most owners praise the model we determined best here for the GABA and Umami features. Those who primarily cook brown rice were also the most happy with the Zojirushi model. A few customers complained that the non-stick surface of the Zojirushi pot began to flake after a couple of years of use. Zojirushi's own manual asks cooks to take extra care washing and using the pot; recall the warning not to rinse rice in the cooking pot. The Zojirushi machine proved easy to clean with a detachable lid and solidly built parts. It has one of the most detailed owner's manuals we've ever seen, with precise instructions such as "wash by stirring the rice by hand 30 times." (We didn't bother to count.) On the other hand, the instructions address nearly every question one might pose. The SR-DR101 is a very straightforward model—so it won't intimidate novices—and was second only to the Zojirushi in terms of the quality of rice and taste. The microprocessor controlled fuzzy logic cooker has a 5 cup capacity (dry). There's just four buttons on the front panel for quick cook/steam, white rice, brown rice, and porridge/soup. A plastic steam basket is included for making vegetables or fish while cooking rice. There's also a keep warm button should you want to extend the warming period. Taste tests with several varieties of white rice proved to be a challenge for some reviewers. The amount of moisture and flavor in the white rice it produced was extremely close to that produced by the Zojirushi, although the Panasonic cooker's rice was not quite as fluffy. Brown rice tests separated the rice from the chaff. Tasters were happy enough with the Panasonic results but found its brown rice was not quite as moist or as flavorful as that produced by the Zojirushi. On the other hand, one reviewer found Panasonic's chewier brown rice had a more interesting, nuttier flavor. Customers who purchased the Panasonic model like its simplicity. A few also noted that when making rice they also use the steamer on frozen vegetables (although it doesn't have much capacity). The main criticisms by owners referred to the moisture build up near the steam vent and the fact that extended warming times tended to dry out the rice. The Panasonic SR-DR101 does not have a digital display or a built-in timer for setting up the rice before you leave for work. When it came to cleaning, the steam vent on the Panasonic was a little more awkward than that of the Zojirushi or Aroma models. Instead of popping out from the top, the steam vent snaps into place under the lid, making it feel a little more fragile under heavy use. The cooker also does not have a handle or side-mounted rice paddle holder, unlike the other two. But those looking for a reliable, no-fuss rice cooker aren't likely to miss these two minor accouterments, especially considering this excellent cooker is nearly $150 less than the Zojirushi. Better known for its massive, 20-cup basic electric rice cookers, Aroma bills itself as the "#1 Rice Cooker Brand" and is a perennial bestseller on Amazon. Certainly, at just $50 the Aroma ARC-526's price is right. 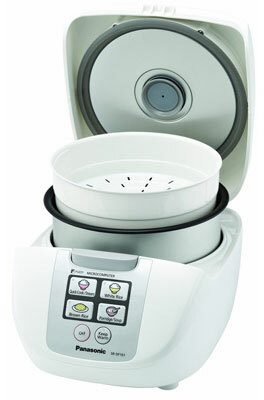 The ARC-526 is a fuzzy logic model that can cook up to 12 cups of rice. Its main controls include buttons for keeping warm, setting a delay timer, steaming, and slow cooking. You select what kind of rice you want to cook from a menu: white rice, brown rice, quick rice, or sushi rice. There's also an STS (saute then simmer) setting and a cake baking setting. The latter two are not likely to make cooks switch from the standard stove and oven methods, but they're useful if you don't have an oven. Like the Panasonic model, the Aroma includes a plastic steam basket. Steaming in either machine takes practice, since you have to put ingredients in mid rice cooking cycle. Get it wrong and your veggies will be too crispy—or limp. Although the Aroma did not win any of the rice taste tests, it did very well. White rice was never over or underdone; but it also never really impressed the judges. Brown rice fared less well, with some testers finding the rice slightly under cooked and yet not as flavorful as that produced by the other two cookers. The Aroma model is very easy to use. Its instructions are simple yet extremely clear. It even makes it plain that rice should be measured dry and then emptied and rinsed in the cooking bowl, something that's not obvious to beginners. Aroma's quick start guide will get you making rice in minutes. The Aroma model we tested is new to the market so customer reviews for it were not yet available. Once you've owned a rice cooker, it's almost impossible to go without one again. The quality of the rice will make you appreciate this staple anew. If you typically overcook, burn or otherwise struggle with cooking rice, all three models here will be a welcome relief. The Panasonic SR-DF101 offers the best blend of performance and price. Though if you cook rice regularly and are looking to expand your gastronomic horizons, nothing beats the Zojirushi Umami NS-YAC10 for the ultimate in rice flavor and texture.